Many cooks attempt to tweak a spaghetti carbonara recipe in order to make it a little less heavy on the calories. That is missing the point. If you are watching your weight, there are plenty of healthy alternative pasta options. When it comes to carbonara, the dish relies on the finest, richest ingredients. Carbonara is a dish that seems a long way from the Mediterranean diet we associate with Italian cuisine. It originated with shepherds in the Apennine hills around Rome. They carried cured bacon, made their own cheese and came up with a delicious pasta dish. 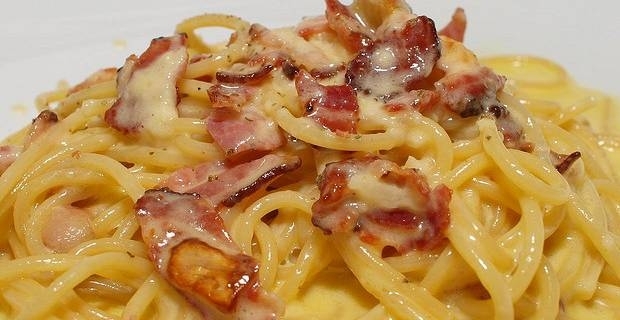 The classic carbonara recipe for pasta usually involves cream, eggs, bacon or pancetta and cheese. It's not for the faint-hearted, although it should be noted that in the UK we have a habit of putting too much sauce on our pasta. The pasta should be lightly dressed, not swamped in a mound of egg and bacon like the pasta version of a full British breakfast. A classic carbonara starts with pancetta, or, if you can't find the authentic Italian stuff, with bacon (but avoid the strongly smoked varieties). The pancetta is cut into small strips and fried in a little olive oil until browned. Four egg yolks are added to a little milk (or cream if you want a truly luxurious result) and beaten. Add some grated mature Pecorino cheese. When the pasta is cooked add the pancetta and the eggs and cheese mixture. The egg should not be cooked, except from the residual heat of the pasta. Serve with plenty of black pepper. The most familiar carbonara recipe usually calls for spaghetti. In the Lazio region, near Rome, locals prefer to use bucatini, a variety of long pasta with a hollow centre. Nobody is going to complain if you serve up your carbonara with tagliatelle, or even penne. Fresh pasta is fine but the best quality dried pastas can be superb.